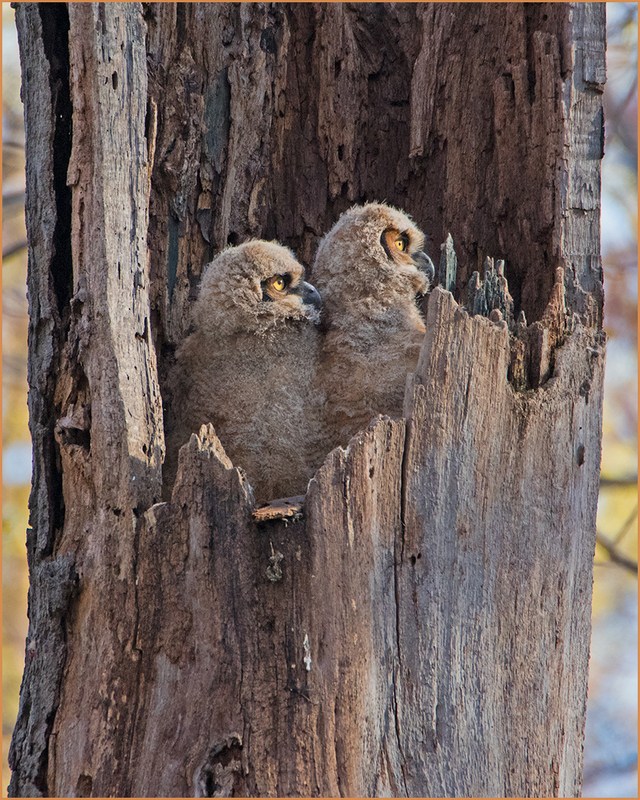 The Owlets above are looking in the direction of a crow flying in their direction. They point their heads skyward as the crow flies overhead. They are really cute, but will be fledging soon. I am planning on going back when they do. 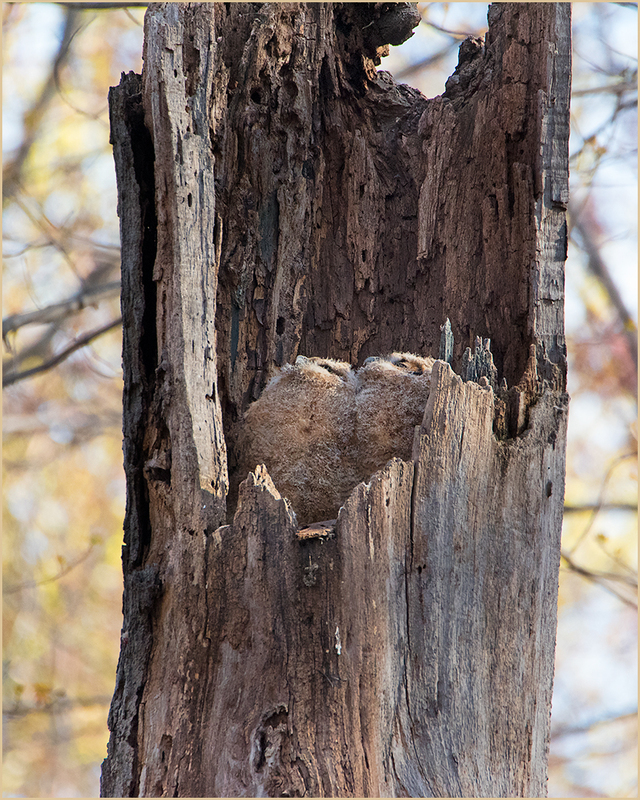 What we were told by some local photographers was that owls don’t actually fledge. They fall out of the nest to the ground. We asked what happens then. Apparently, they walk over to the base of the pine tree where the parents rest during the day. Mom flies down to feed them. I would love to be there when they clumsily walk that distance. 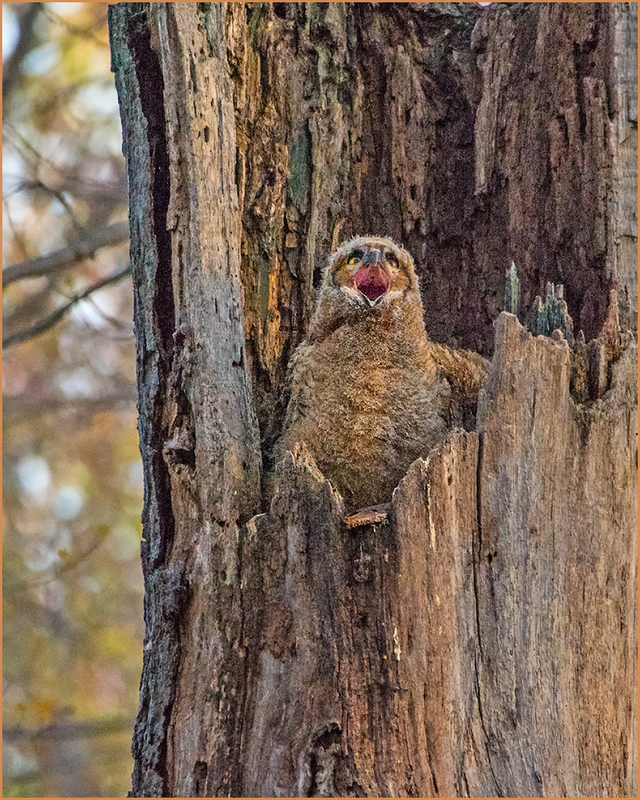 It might look like the owlet is screaming out for mom, but was just having a good yawn. Look how wide it opens its mouth. My camera setting were quite pushed in these images. 850 mm – 1/640 sec. on a tripod, f9, ISO 3200. The WB was 7200K which warms up the images taken in late afternoon when the sun was getting close to setting. It was getting slightly dark so I was constantly adjusting settings. 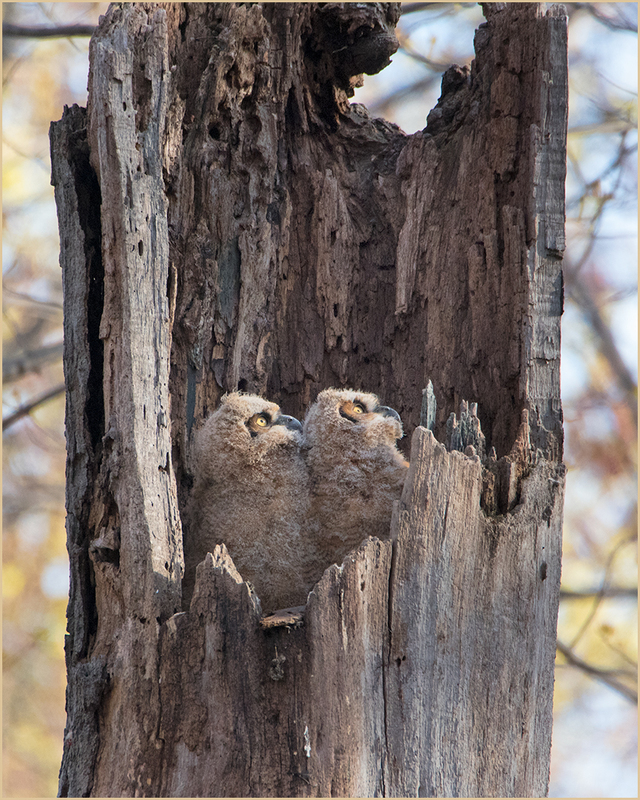 This entry was posted in Birds, Nature, Photography, Photos, wildlife and tagged Great Horned Owlets, Owl yawning, Photos of baby owls, two Great Horned Owls in the nest. Bookmark the permalink. Nice captures. I love the way they appear to do everything in unison. Thank you, David. They are pretty cute when they move the same way. Oh my God, these are priceless. Such comical-looking characters.The site I posted with the poppa Great Horned Owl, has brought forth a couple of Owlettes.Don’t know if I will get to see them in real life, but I saw large photos of them at the drug store where they were developed, which was very cool..
Great you had that experience. Hope you see them. Awesome captures, Donna, so cute and beautiful! Fantastic captures, very comical. They look so cute! Oh – what an absolute delight!!! These shots are so sharp and make you feel like you’re right there next to them!! Thank you for sharing, Donna! Funny about the fledging question….maybe it depends where their nest is. 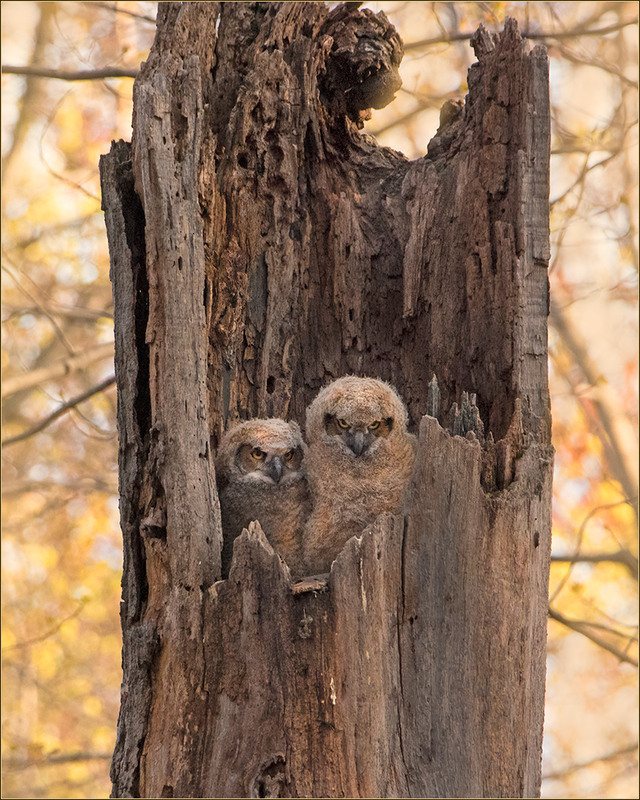 We had GHO owlets last year in our refuge, that we watched from tiny newly hatched birds to nearly adult size. They gradually ‘branched’ out further and further from the nest, and ‘practiced’ using their wings till they finally flew short distances, before eventually taking off. The parents actually ‘called’ to them from slightly further distances as the weeks passed. All of this high up in the Cypress trees along the trail. Birders and photographers alike were thrilled! That is a great story. Thank you. These owls are also flapping and getting close to the edge. I can’t get enough of those wonderful eyes.